Welcome to our individual interviews with Candidates running for local elections. All candidates were given the same questions and allowed the freedom to answer as they see fit. We did not alter any of the responses so you are hearing things directly from them. In this interview we are introducing you to Linda Gonzalez. Mrs. Gonzalez is a person who has spent a long time in the Rialto area. 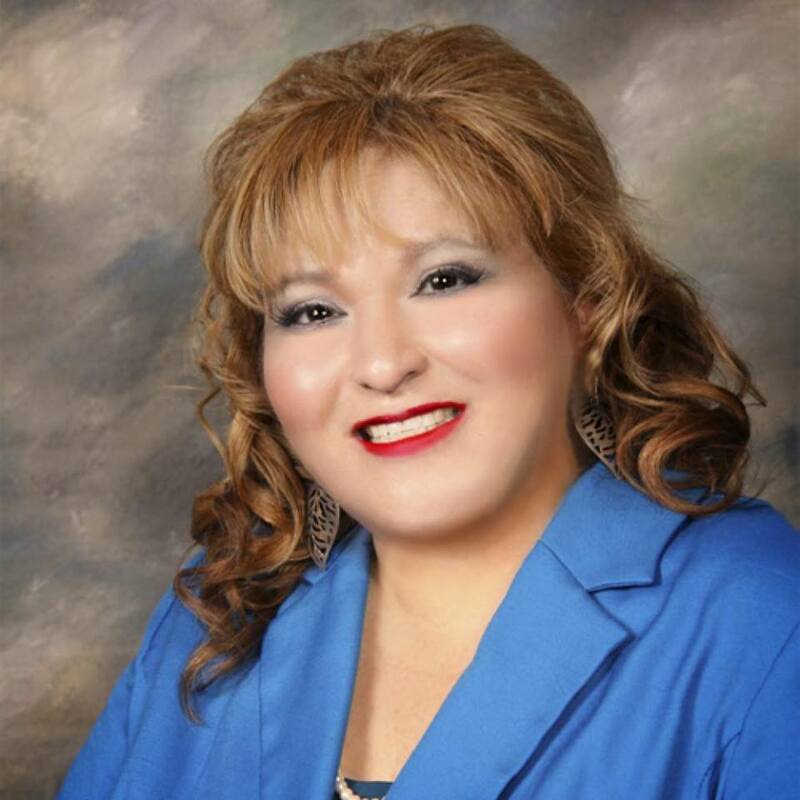 Mrs. Gonzalez is also one of the elected incumbents seeking re-election to the West Valley Water board. 1) Tell us about yourself where did you grow up, go to school and work before? I was born in Los Angeles. In 1985 I was married and we decided to buy our first house in the City of Fontana in 1986. I have attended local community colleges in the area and raise our four children who are young adults now. I currently work at our family owned business since March 3, 1988 in Fontana California. In 1990 we relocated to Bloomington California and decided that is where we raise our four children, all our children attended grade school through Bloomington high school and graduated and continued on to colleges and universities. 2) How does your past make you a good candidate for West Valley Water Board? My whole life I have been a community advocate in our local areas I care about our cities and towns. I have served in the following boards or Business organizations. A. Bloomington municipal advisory Council (MAC) served 13 years.(1998-2011). Four years as chairwoman. b. Fontana Area Chamber of Commerce Board of Directors served six years. (2000-2006). C. Bloomington woman’s club served as President four years. 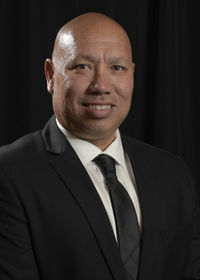 D. Colton unified school district (measure G) committee served as the vice chair for six years. E. Volunteered in the Girl Scouts of America many years.Bloomington Little League volunteered as a team mom. 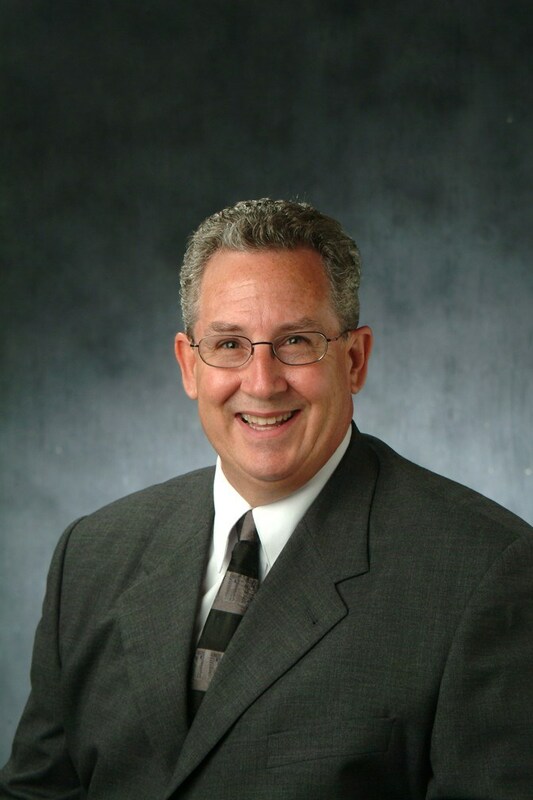 F. I currently serve as vice president on West Valley Water District board from December 2013 -to present. I understand what it is to have a well fiscal year budget balance. I have the knowledge on how to implement ideas on the table to help our general manager and the water district team to succeed in securing future funds for the water district and on behalf of our ratepayers. 3) Some of you are incumbents what have you learned since being elected or appointed that you didn’t know until you sat in the elected seat? I am currently the vice President of our West Valley Water District. I have Learned that water is more difficult than what it seems. Water has to be treated and it has to be transferred from point A to point B meaning from our wells and reservoirs to your homes and business.The state regulates water very highly. 4) How important is transparency to you? Transparency is very important to me. From always respecting our water district ratepayers to our internal departments. We should always have open communication. There should always have an open door policy at this water district. 5) Do you believe that partisan politics have a place within a water board seat? I am here to represent all people across the board all walks of life. 6) What is your impression of the communities freedom of speech? Our First Amendment gives us rights to freedom of speech. 7) What are your thoughts on budget surpluses? Should they be a certain percentage of the overall budget or are they even important? The district should have a budget surplus for in case of a natural disaster or to slowly address aging infrastructure,1/3 of the budget surplus is for restricted funds for our bonds. In this interview we are introducing you to Robert Bourland. 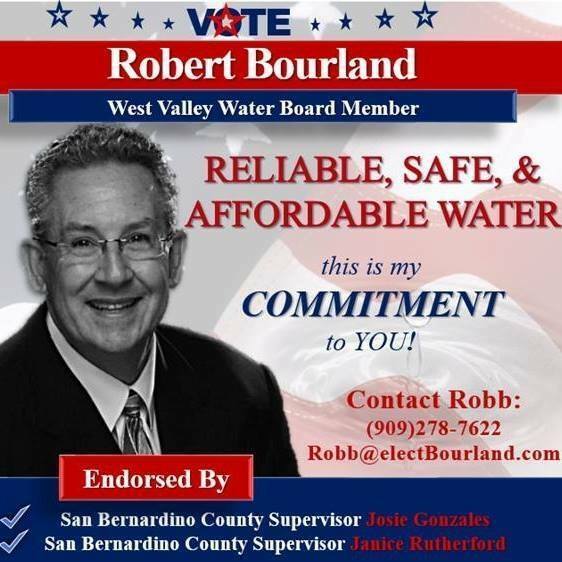 Mr. Bourland is a person we didn’t know a lot about and he was appointed to the West Valley Water Board by the Board of Supervisors to fill the appointed spot that Rafael Trujillo vacated after he was elected to city council. Mr. Bourland was the successful candidate and appointed to this position by the San Bernardino County Supervisors after an exhaustive search and interview process over a number of other potential candidates. There are a couple of candidates that have an extensive background in providing utility services to this region and Robert Bourland is one of those candidates, enjoy. First, I’d like to express my appreciation for bringing out the real issues the voters should be looking at and not the partisan political statements, the slander that’s been so freely flowing and the made-up promises that cannot be delivered unless appropriate due-diligence is done, contrary to some of the political propaganda being propagated. I have lived in Rialto since 1964. I went to Morgan elementary, Frisbie Junior High, Eisenhower High, San Bernardino Valley College and California State San Bernardino. While attending college I worked full-time at Stater Brothers grocery stores. After obtaining my Bachelor’s degree I started my career at Southern California Edison as a meter reader, ultimately retiring as an Executive. Along with serving on the WVWD board, I currently serve on the Board of Directors at Anand-PAG LLC. I have over 35 years of experience in the utility industry, including water, gas and electric. Prior to my retirement at SCE, I was responsible for the entire portfolio of applications at the company including Customer Service, Transmission & Distribution, Generation, Conservation, Technology etc. This is exactly the same work that West Valley Water District does, except that SCE was on a much larger scale. I KNOW this business, how to run it, fix it, make it more efficient which ultimately leads to safer, more reliable and the most affordable water possible. Overseeing a water district is very similar to overseeing any other utility which I have spent my last 35+ years doing very successfully. I’ve been disappointed to learn that in dealing with elected officials and “wannabe” elected officials, they are willing to say things to garner votes, instead of doing what’s right for the district, employees and ultimately the rate payers. My commitment is to always focus on the issues at-hand and deal with them keeping in mind the best interests of our constituents, employees and the water district. I will not be influenced by political inclinations or other outside influences. Transparency in an organization builds trust amongst employees and our ratepayers. It is a critical success factor for the newly elected board to rebuild that trust that has eroded over the past several years. I will accept nothing less than full transparency as we work towards the success of our District. Absolutely not! Decisions made by the WVWD board should be based entirely on the facts of the matter at hand to ensure safe, reliable and affordable water to our ratepayers. As opposed to the stated view of some of the candidates (per their campaign literature), I do not believe partisan politics should have any influence, at all, on the policies adopted by this board. In regards to partisanship on the board, I think it’s important to note that I’m supported by both Josie Gonzales (D) and Janice Rutherford (R). Freedom of speech is everyone’s lawful right in our wonderful country and I fully support that. I also believe that we should self-impose some moral and ethical boundaries upon ourselves out of respect for one another and our diverse beliefs. Although to-date none of this has been targeted against me, I’m abhorred at some of the campaign literature mailed during this election. Candidates should focus on what they stand for and their value proposition, not putting out half-truths and disparaging remarks about others. As a government entity, WVWD is a not-for-profit organization. The budgeting process is intended to anticipate all costs needed for normal operations as well as unexpected events. Because WVWD is a government agency, there is no “budget surplus” built into the budget. The budget will be “even” where the incoming revenue is equal to the expected expenditures for the upcoming year. o Emergency funds for leaks, breaks, failures etc. 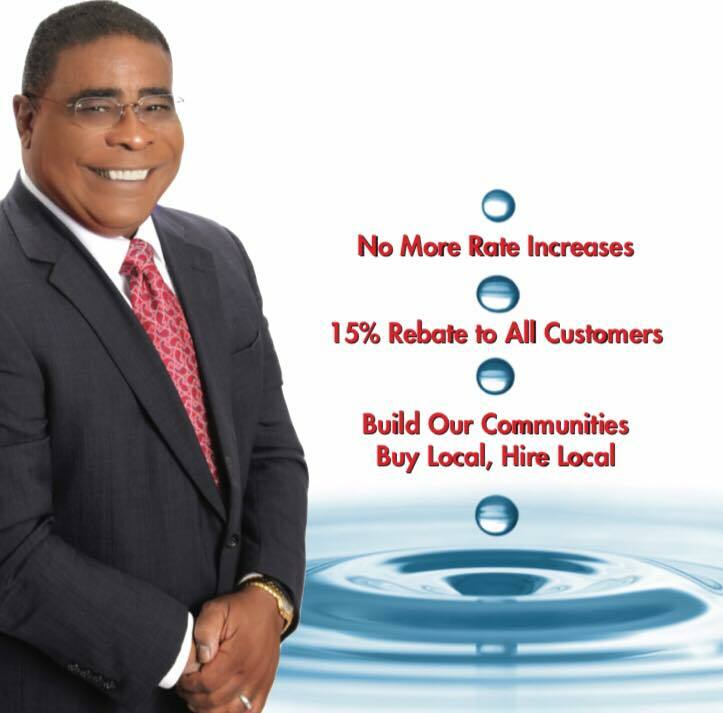 My commitment is to insure that the costs to obtain our water, to purify our water, to deliver our water to our constituents will be the lowest possible, which will lead to the lowest possible rates to our customers. List any and all contact info people can use to get a hold of you or learn more. Also please include a photo we can use for your article. If you have any video links you would like included please Include those as well. In this interview we are introducing you to Butch Araiza. Mr. Araiza is a person who has basically lived his entire life in the Rialto area given back in so many ways and has worked his entire life at West Valley Water. 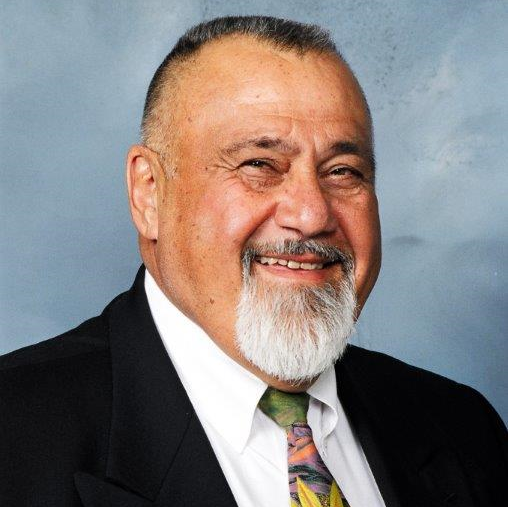 There are a couple of candidates that have an extensive background in providing utility services to this region and Butch Araiza is one of those candidates, enjoy. I was born and raised in Rialto. I was in one of the first classes to go through Boyd Elementary, and then I went on to Rialto Middle School and Eisenhower High. I’ve taken courses at Valley College and Cal State San Bernardino, and while those were important in helping me learn the science behind water distribution, my real education came on the job. I started at West Valley Water District when I was 19 years old, thinking it would be a good summer job–I went on to work there for 52 years. I started out in irrigation, working to help get water to the citrus groves that used to cover the area, and I slowly worked my way up through just about every department in the district until I reached the level of Superintendent. As Superintendent I was responsible for all field operations for several years. After that I become Assistant General Manager for 10 years before becoming the General Manager. I served as General Manager for 20 years. I have been involved in water for almost my entire life. I’ve served in the management of the District for over 35 years. I know water. And I also know this community because I’ve been involved in it my entire life too. I’ve been a member of Rialto Rotary for over 20 years, and have served as president of the club several times. I’ve been one of the organizers of the Rialto Run Whatcha Brung car show since it began. I was a member of the Rialto Planning Commissionfor 8 years, and served as Chairman for several of those. I spent over 20 years on the board of the Friends of the Rialto Police K-9s. And finally, I was a member of the Oversight Committees for the last two school bond measures for Rialto Unified School District. Almost all of that work was as a volunteer, because I care about this community. 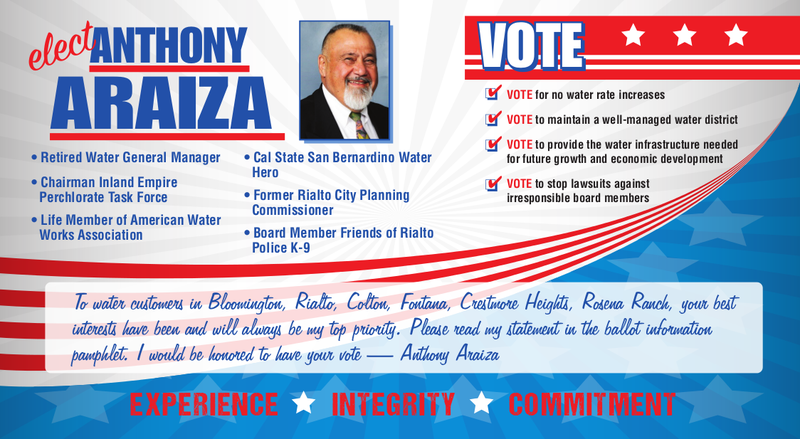 I am not an incumbent, but I have been involved with the water board for the last 20 years. The thing that has most surprised me about recent elections is the amount of partisanship that has become a part of it. In the past we’ve had people with different viewpoints on the water board, and there have been disagreements over policy, but I never once questioned that board members were making decisions based on the well being of the district. In the past four years that has changed. 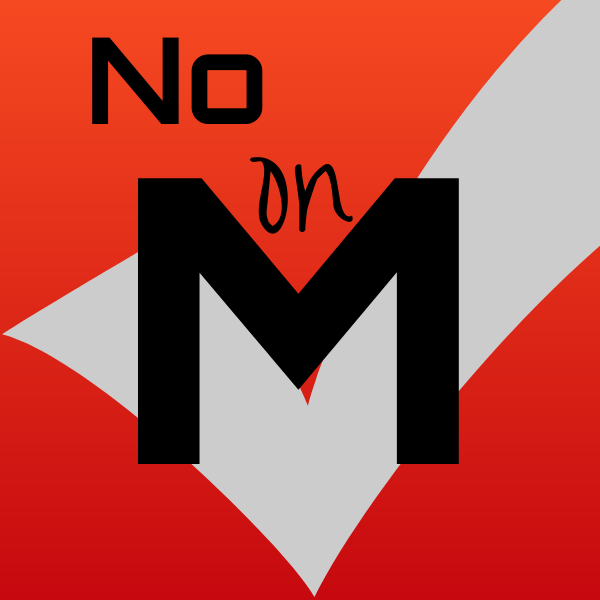 Certain board members have become far too involved in the hiring and firing practices of the district, and they have taken a direct hand in managing the district by directly overruling the day-to-day decisions of district management (the people who have experience in these issues, and who are paid to make those decisions). Additionally, I have seen board members do things like initiate baseless investigations just so that they could send out negative campaign literature claiming that other candidates are “under investigation.” And, of course, those investigations are dropped as soon as the campaign is over. I would encourage voters to research these issues carefully before believing anything they receive in the mail. And I hope, that if I am elected, I can help restore an ethical water board (I know that Linda Gonzalez and Robert Bourland also share this hope which is why I have endorsed them for the other open seats). I believe transparency is extremely important to good governance. Many of the changes that have been made to the Board of Directors’ rules and procedures since I left management are troubling to me because I feel that they decrease transparency. I support an ethics code for the board and a return to the rules of order that existed prior to last four years. No. A board seat is a non-partisan position meant to oversee the management of the Water District. The board is there to set overall policy for the district, approve budgets, and to make sure that the district manager is doing his or her job. Those are not partisan issues. 6) What is your impression of the communitiesfreedom of speech? I believe that freedom of speech is the cornerstone of our democracy. Without a free discussion of the issues no consensus or compromise could be reached, and only those with the right “opinion” would be allowed to participate–a system like that is not sustainable and it’s not good for the people. On my Facebook page you can find my direct cell phone number. I put that there because I want the people in this community to be able to speak to me directly; to voice their concerns, criticisms, and even just to talk about the district. I welcome it all. Speech is very important to me. The district should not have extreme budget surpluses. Of course, in any given period of time there will be times when the district is able to get good deals or somehow decrease costs resulting in a short term budget surplus, and that’s good–it’s a sign of good management. But sustained budget surpluses are a sign that rates can be decreased. Now that is not to say that the district should not have savings. If a large natural disaster struck our community, without savings the district would have no efficient way to rebuild any infrastructure that is damaged and it would be difficult to restore service to the community without taking out expensive loans. Everyone needs a rainy day fund and the district is no different. That said, the district currently appears to be in a good financial situation and I feel confident in guaranteeing that I will not vote for any rate increases unless there is some catastrophic change in that. It seems as though nothing has changed when it comes to providing clean drinking water to 11 cities in 2 counties. You may remember a few years ago when we covered corruption and misuse of funds on the West Valley Water District Board of Directors. Then Councilman Shawn O’Connell a resident of the water district called out blatant areas where funds were being misused, board members were being bullies and political lines were being drawn in the sand. It became so bad that groups that previously supported Councilman O’Connell threatened to pull their support of him if he didn’t stop his questions of board member Clifford Young. Now Clifford Young is running for re-election and he is looking to buy residents votes, spreading lies about other candidates and turing on those who once supported him. I’d like to respond to some of the attacks that have come out recently against Linda Gonzalez and myself. They are lies, plain and simple. I’m proud of my 35 years of management of the district. During my time as manager we built two water treatment plants. We kept the water supply safe, despite the discovery of perchlorate pollution. Rates may have gone up in 2013 but that was because we refused to raise rates at all during the economic recession following 2009, and despite the rate increases our district’s water rates are lower than both Rialto and Fontana’s water rates. If the district had been mismanaged for 35 years, we wouldn’t be able to say any of that. Regarding the claims made about Linda Gonzalez, I’ll just say this. 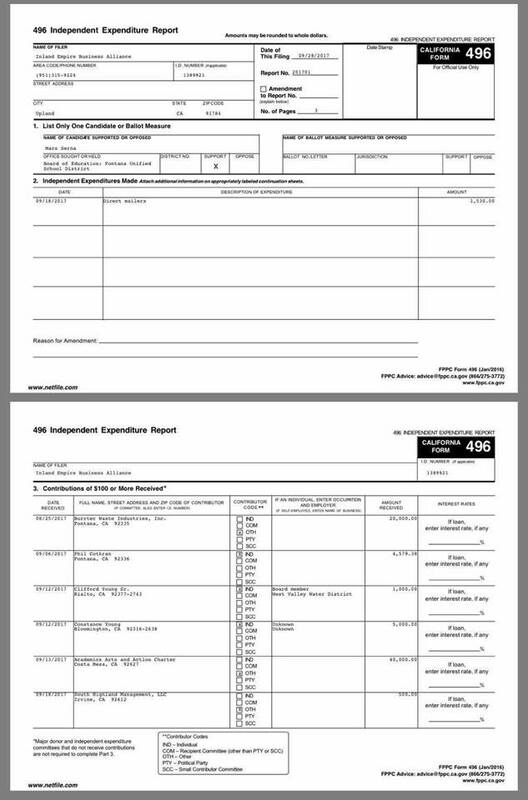 I can provide anyone with records of Freedom of Information Act requests made to the district which show that in the last three years Linda Gonzalez has been paid $34,000 for her work on the board. In that same time Clifford Young was paid $97,000 for carrying out the same job. He did this by going to as many “business” lunches and trips as possible and by gaming the system to get extra perks. So who is really trying to take all the money they can from the district? Butch Arizia. 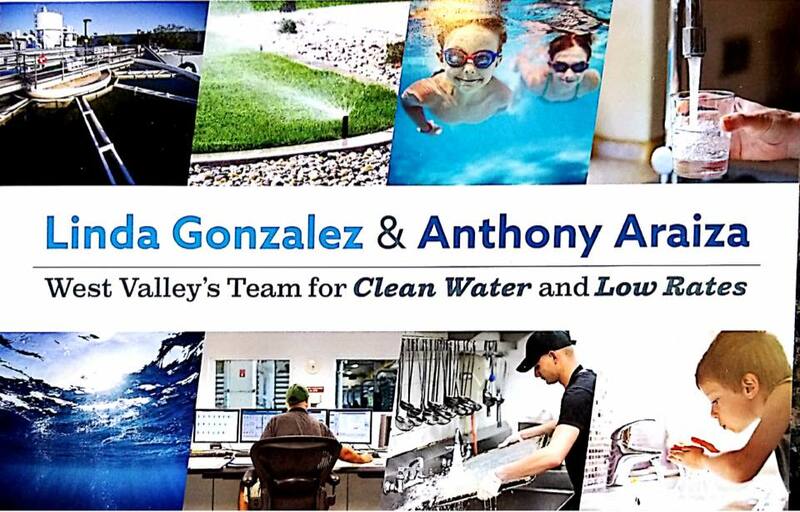 Mr. Arizia is right he did an excellent job as the General Manager for West Valley Water. Not only did the Water District not steal millions from rate payers like Rialto Water did to clean up Perchlorate from the ground water. Rialto Water charged the residents Millions to clean up the water then spent over 50 million (Tax Money)on attorneys to sue the people responsible then settled for pennies on the dollar. Mr. Arizia also kept West Vally water from making a monumental mistake that would have done extreme damage to West Valley Water. When the Rialto City Council was forced to remove American Water as the preferred company to handle the selling off of a utility the council went to West Valley and more importantly Butch Arizia to see if West Valley wanted to step in. Butch Arizia took one look at the contract and knew it was a poorly put together plan that made delivering on the Capital Improvement Projects (CIP) impossible. He was right because Rialto Water customers still have water that is hard to drink, skyrocketing water rates and none of the Capital Projects completed and many are way behind schedule over 5 years later. Another former General Manager from West Valley Water who worked under the regime of Clifford Young left and when we bumped into him he was beyond happy to be out of West Valley Water and out from under certain people’s thumbs. One of our favorite stories we wrote on Clifford Young was when new board members were sworn in and Clifford Young took this opportunity to change the rules of open meetings making it harder for the public to address their elected officials. Another one we enjoyed was when Clifford Young ripped into water employees. Some people are claiming that Clifford Young is buying votes with his latest campaign ad (see below). If purchasing your vote isn’t bad remember Clifford Young is the person most responsible for giving support to Rafael Trujillio the Councilman from Rialto that worked behind the scenes to turn Rialto into a sanctuary city putting millions of dollars in Federal grants in jeopardy. A collection of campaign contributions have come in for Fontana School Board member Mars Serna. Over $71 Thousand in campaign contributions have come in for a special election against one other person community advocate Kareem Gongora. Now what would a trash provider get out of donating to a small school board seat? Maybe a sweet deal on a contract? Even bigger than that is the $40 thousand dollars coming from a Charter School in Orange County believe us when we tell you this money does not come without massive strings attached. This election is a special election that once the election is over and the winner is sworn in they will have less than a year until their seat is up for re-election. The real story here is a power grab by Warehouse Warren (aka Fontana Mayor Aquenetta Warren) she has two votes that will do her bidding on the School Board and since her third puppet is now on Fontana City Council she needs another one. Her pick is Mars Serna. Speaking to Kareem Gongora the other candidate in this election isn’t taking donations like these he is relying on family, friends and the community to send him to the Fontana Board not large corporations and Charter Schools. We have asked Mars Serna to sit down with us and he refuses so I guess he would rather leave us to make up our own minds about these dirty campaign contributions. The community of Flores Park had begun to experience a growing problem with bug bites as August started. Bug bites mostly from mosquito’s were popping up everywhere and residents were concerned about what was causing it. So what did the community do? They reached out to each other the only way we know how through digital media. 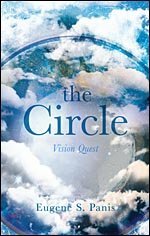 The source being used most by people looking to find out what is going on around them has become NextDoor. 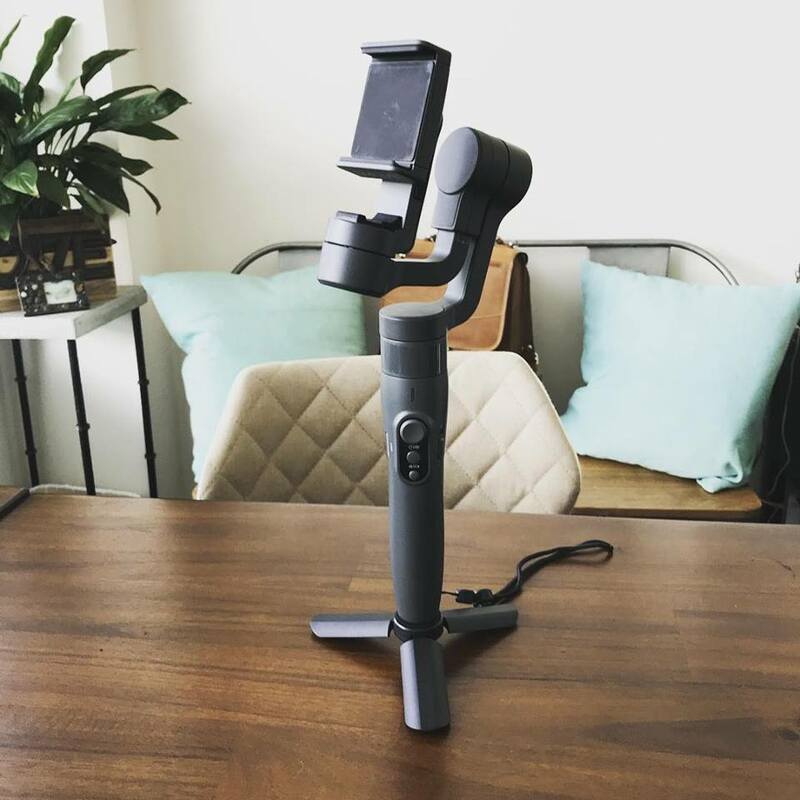 Venture capitalists created the site as a way to give the communities around the nation a safer avenue for communities to hook up digitally when discussing safety and concerns in their community. Parents of local school Dollahan Elementary thought the problems were just more inactivity on behalf of school officials to keep kids safe at school. Dollahan has and still has a massive problem with a Fire Ant infestation and other bugs that seek out human hosts. Parents have been less than thrilled with the schools response over the years to the problem which is worse this year as Solar Panels are being installed on the kids playground stirring up the problem even more. What the community failed to notice was the massive catch basin that San Bernardino County Flood Control was constructing. The mosquito problem had manifested from the new catch basins that were constructed just west of the intersection of Baseline and Cactus. In a statement from San Bernardino County vector control, vector control had stated that the water had been treated for any potential further mosquito growth. 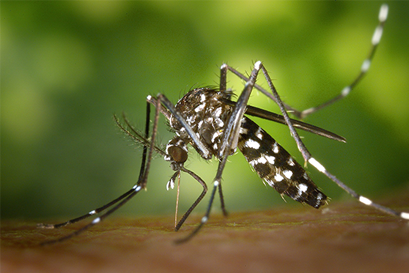 Vector control also said that the adult mosquito has a 10 to 14 day life span so if people it within the affected community needed to be out and about when mosquitoes were active that they were suggested to wear mosquito repellent. 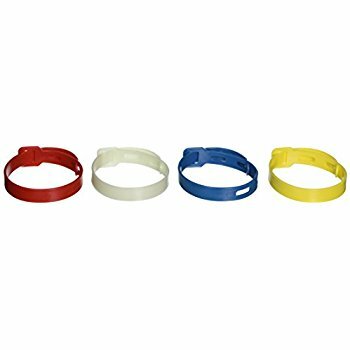 Some parents with children attending Dollahan Elementary have purchased bug bands for their kids, these bands attach to the child’s wrist and keeps mosquito’s away. The biting is far from over because the water treatment can take 7-10 days to take effect and we still have to wait for the remaining adult mosquito’s to live out their life and die. So if you live in our near the Flores Park Area you may want to try and stay indoors or wear mosquito replant when outside.